Jason Smith will receive his bachelor's degree in computer engineering Saturday, May 20. Image Credit: Jonathan Cohen. Jason Smith will receive his bachelor's degree in computer engineering Saturday, May 20. Photography: Jonathan Cohen. Which of these is tougher to pull off? 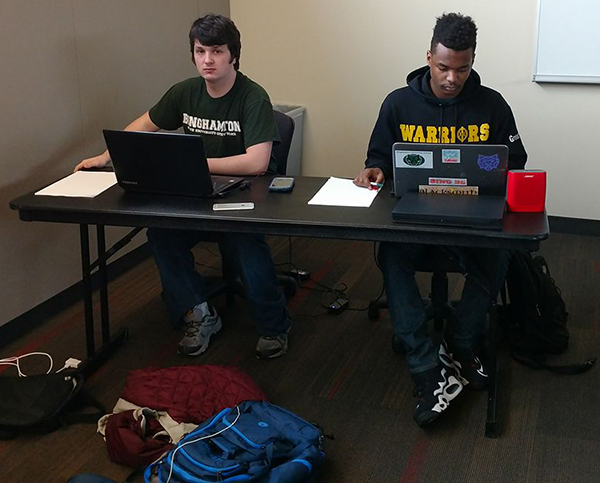 An All-American competitive debate season with a top-10 team finish in the 2017 Cross-Examination Debate Association (CEDA) national tournament or finishing off a Binghamton University undergraduate academic career with a degree in computer engineering? Jason Smith and the rest of the Binghamton Speech and Debate Team at the National Debate Tournament in Kansas in March. Image Credit: Provided. The top spot is debatable. 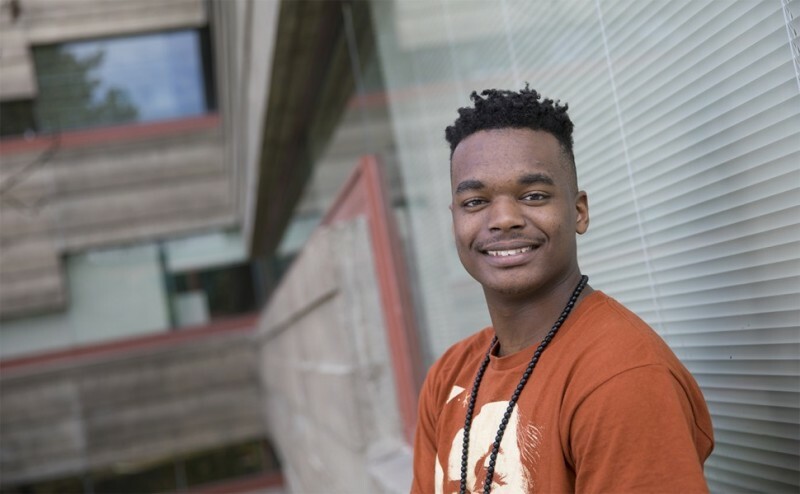 Jason Smith ‘17 is the perfect person to make a case for both. Not just because he was the president of the Binghamton Speech and Debate team this past year. No, when he walks across the stage on May 20 at the Thomas J. Watson School of Engineering and Applied Science Commencement Ceremony he will have performed each feat. Smith began to debate competitively in high school. 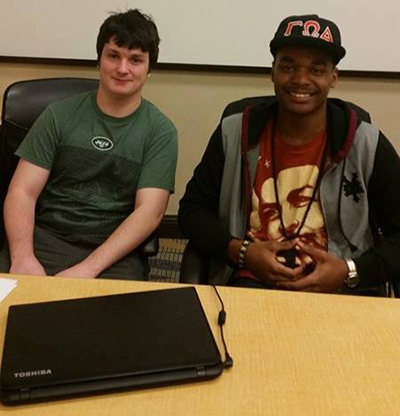 Even though the computer engineering program in the Watson School drew him to Binghamton, the debate team sealed his decision to attend. “The combination provided a unique opportunity to engage at different intellectual capacities, which challenged me on multiple levels. The intellectual rigor of debate is something that you can’t find anywhere else,” he said. Jason Smith and T.J. Buttgereit in action in one of their debates. Image Credit: Provided. One of the most rigorous tournaments in the nation is held annually by CEDA, which is the primary national association promoting policy-topic intercollegiate academic debate. Smith’s four-year career at the collegiate podium culminated with Binghamton’s sixth-place overall team finish in the CEDA national tournament at Johnson County Community College in Oakland Park, Kan., on March 20. Binghamton was third among public schools. Individually, Smith and his debate partner, T.J. Buttgereit ‘18, were named to the CEDA All-American team after they reached the Sweet 16 of the pairs tournament. They were the first Binghamton duo to reach the elimination rounds since 2012, and their final loss was to the eventual national champions from Rutgers, 3-2. 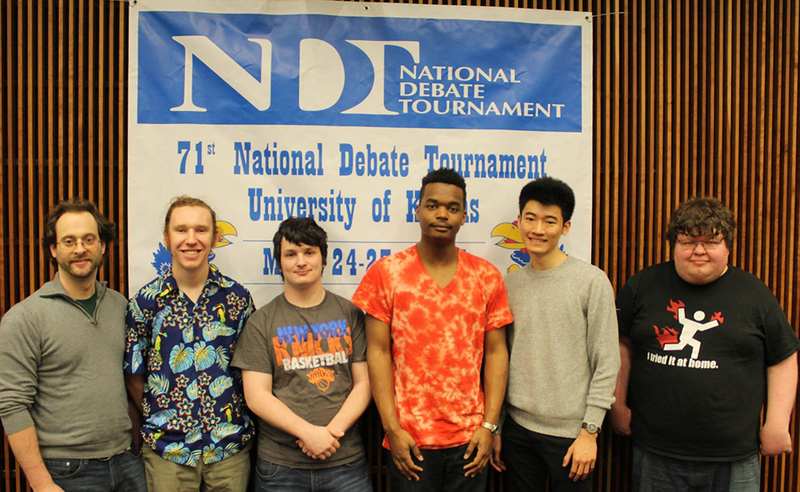 Beyond those accolades, they turned around the next weekend and swept teams from Wake Forest, Northwestern and Dartmouth at the National Debate Tournament at Kansas University, March 24 and 25. The whirlwind schedule, and the example set by Smith, is something that Buttgereit won’t forget. “One thing that has always impressed me about Jason was his ability to see both sides of an argument. Not only can he see it, he can articulate it persuasively. Because of this he is very good at tailoring his arguments to answer the best version of the opposing view. It’s a skill, I think, even some of the greatest debaters struggle with, and it’s something that I think has really set Jason apart,” Buttgereit said. The argument articulation may not seem related to the complex technical projects Smith did in his engineering classes — hacking network communications or intercepting traffic over the internet — however, to Smith, they are. Jason Smith and T.J. Buttgereit before one of their debates. Image Credit: Provided. “I had a difficult transition into college from a volatile living situation at home. The task of learning how to balance two seemingly opposite activities, and become effective in both, helped me,” Smith said. Clear communication, research preparation, organization required to formulate complete thoughts and the ability to plan multiple ways to attack a problem are skills that both disciplines require. Even if the initial query about challenges of debate vs. diploma is still open, it is definitive that Smith has enjoyed his time at Binghamton University. Aside from arguments and experiments, he also served as the vice president of the Society of Hispanic Professional Engineers this year. He is a member of the Gamma Omega Delta Fraternity, participated in the Binghamton Intervarsity Christian Fellowship, was a member of the Bearcat Motorsports team and performed SLAM poetry. He was a coding service-learning instructor at the Central Queens YMCA last summer, and helped teach John Bowne High School students how to develop computer applications in Java.